Places to visit before you die: Check them out! Whether you consider yourself a whole adventurous and prefer for your vacation or travel to exotic places with history, and to lie on the beach sunbathing is not for you, discover some of the places in the world that every human being should visit at least once in life. Contrary to what we usually see normally, all of them are the work of the nature and its inhabitants have been respected for its beauty, so go ahead and travel the world to know, since none is priceless. You tired of seeing the same thing during the holidays, as the beach and the sea, or the typical mountain cottage, and prefer to innovate and travel the world to learn about other places, but do not know where to start. Well not consider yourself a freak because you’re not the only one who would like to hear some of the most beautiful places considered more curious or the planet, so take note, and certainly will not regret. 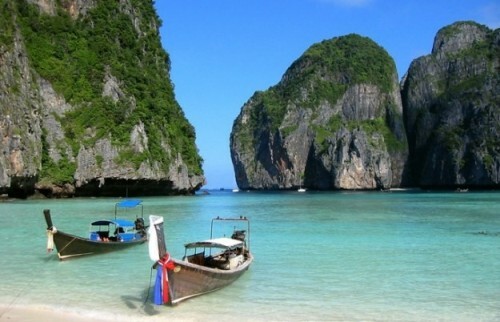 Phi Phi Islands: This archipelago in the south of Thailand consists of the islands Ko Phi Phi Don, Koh Phi Phi Leh, Koh Yung (or Mosquito Island) and Koh Pai (or Bamboo Island), is one of the most popular destinations to enjoy honeymoon. Ascher Hotel: If you are looking for a hotel to enjoy with your friends on a vacation, or to do with friends, this will be a perfect choice. It is in Alpsteingebiet in the northeast of Switzerland and is carved into the rock of a 100 meters high rock wall. Antelope Canyon: Located in the state of Arizona, in the Navajo Indian reservation in Page, and although it has been relegated to second place by the legendary Grand Canyon, has nothing to envy, with walls up to 40 meters high and 400 meters long, its color changes are spectacular. Keukenhof Gardens: 30km from Amsterdam, in the locality in which it is named, are situated these spectacular tulip gardens that open only eight weeks a year, so if you’re in the area in the spring, and leverages and you won’t regret it. Morning Glory Pool: Located on the famous Yellowstone Park in Wyoming, is one of the many geysers that decorate the place, noted for its polychrome, ranging from dark blue to red from the shore. Plitvice Lakes: National Park Plitvice Lakes is suitable to visit in any season. Located in Croatia, consists of 30,000 hectares of which 20,000 are covered with forests where 16 lakes flow between rivers and waterfalls. Ta Prohm Temple: This is a Khmer temple in the late twelfth century, which served as a Buddhist place of worship for many years, and almost aggressively, has been devoured by nature showing a very peculiar images. Victoria Falls: Located on the border between Zambia and Zimbabwe, are considered one of the most beautiful waterfalls in the world, with 1.7 kilometers wide and 108 meters high, nearly doubling the famous Niagara Falls. Now as you just need to pack, grab your camera, and enjoy!